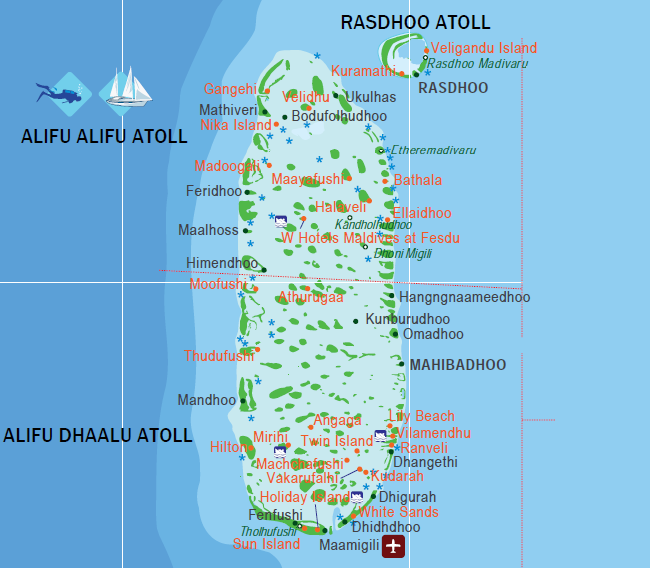 After Kaafu Atoll, Ari is the second most popular atoll in the Maldives. Before exploration of Baa Atoll and other new areas Ari remained as the most popular atoll among scuba divers. Now it is difficult to say which is the best, there are equally matching areas and personal preference varies. This map shows many resorts congested on a particular area in South Ari. That is scuba diving paradise. Between Lily Beach and local island Mahinbadhoo is one of the most popular manta point. 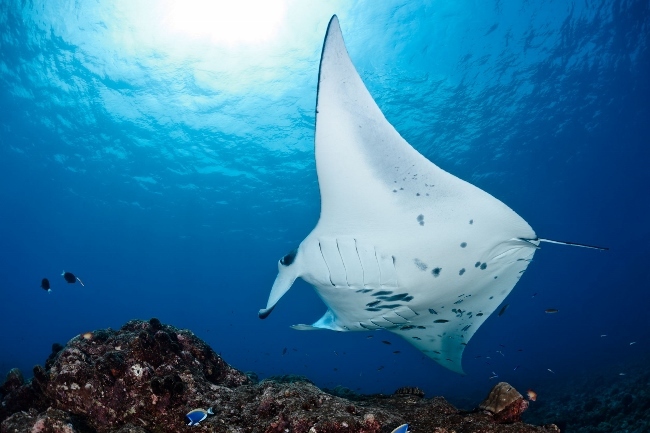 You may not see them year around but in most months the mantas are there. Local Island Dhigurah is the whale shark point that is known nationwide. During the year the whale sharks spend some months near Dhigurah and in other months near Sun Island or Maamingili. If you stay in one of the resorts in South Ari Atoll you are not far from these amazing creatures. All of the resort in this region offers excursions to see them, both snorkeling and diving. Countless spots on the map are islands and reefs. Even though they are usual dive sites in Maldives standard, in reality they are amazing and each is unique with different types of coral and varying species of fish. Divers usually monitor current and weather condition to plan which dive site they want to go.